Abstract: With the advancement of science and technology, modern technologies have created many wonderful products for simplifying people's travels. And Airwheel E3 intelligent e bike is born to be the new-generation travel vehicle combining the high-end technologies. Nowadays, even though more and more cities are becoming metropolis, people living in cities still only need to live in a comparatively small circle. And in such a small circle, there is usually no need for them to drive cars; but the distance is always too far for them to walk. Do we need such a smart electric bike like Airwheel E3? As the new-generation travel vehicles, Airwheel E3 is not designed to be the replacement of traditional vehicles. Instead, E3 citizen e-bike is the complements of vehicles in short and light city travels. Airwheel E3 is the products requiring the least expense in learning to ride. Riders only need to sit on the saddle and they need to push the accelerator in the handle instead of tilting their body gravity centre in keeping balancing of the vehicles. Sometimes you need to get a bike from point A to point B without riding it. This is because of the long distance and it is hard to cram a bike inside of a car. But wait, you have Airwheel E3 foldable electric bike which can simply take up half of the horizontal space without adding too much to its width. 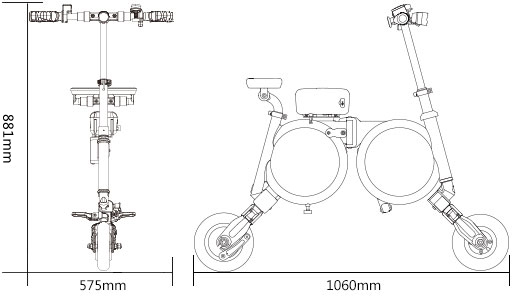 Its main body, saddle, handle bars and pedals can be folded, so that it can be easily carried into buses, subways etc. with the folding size 400x353x472mm. Visiting the friends, going to the park nearby and all other short and light travels in cities will cause no difficulty to people with Airwheel E3 portable electric bike. Yes, Airwheel E3 citizen electric folding bike is people's new and helpful companions in urban life to find the inner peace. Next：Is Airwheel Mini Electric Scooter Safe?